Here is the Cliff’s Notes version from Kansas football coach Charlie Weis’ comments at his press conference today. The updated depth chart (only second-team changes) and full press conference audio have been posted. • Most weeks, KU’s opponents are running schemes where the quarterback is involved as a runner. Weis says KU is going to have to do a better job of tackling the quarterback than it did a week ago against South Dakota, or Rice’s QB Taylor McHargue will gash the Jayhawks. You have to be ready to defend him. You can’t just treat him as a passer. • Weis feels a lot better about his team after it got a game under its belt. He says going on the road can be good for a team, because there are fewer distractions. It’s a lot more of a business trip on the road than people would think. • Connor Embree has had good punt returns the entire spring. This is the first chance he’s had to do it in a game. Weis says he stepped up to the plate and delivered. Embree catches the ball really well on punt returns and makes good decisions. Weis says one of Embree’s best plays was the return when he only gained a couple yards. The ball was bouncing, and he decided to catch it to keep it from rolling. That probably saved KU 20 yards. • From what Weis understands, Rice typically doesn’t have good home crowds. Weis says that’s probably a good thing for his team’s first road game. To go on the road and not have it be 80,000 people going bonkers is probably a good way to ease into a road schedule. • KU’s offensive line had good run-blocking against South Dakota. The pass protection is yet to be determined, because KU didn’t throw it as much. Any time you rush for close to 300 yards, though, obviously the offensive line had something to do with it. Weis believes what KU lost in experience on the offensive line this year, it gained in physicality. He especially believes that’s the case with KU’s two guards Ngalu Fusimalohi and Mike Smithburg. • Weis says he’ll use last year’s Rice game as a teaching tool. He says Rice deserved to win the game last year, and KU deserved to lose it. KU didn’t close out the game. Give credit to Rice. KU played not to lose instead of playing to win. • Rice offensive coordinator John Reagan has a lot of familiarity with KU defensive backs coach Clint Bowen from their time together on KU’s staff a few years ago, so there shouldn’t be many surprises with Rice’s offense for Bowen on Saturday. • Weis says the situation this week for the coaches has been utopia after a win, because it’s allowed them to be harder on the players to make them better. It’s been a bad week for some of KU’s players, because you can really get on them hard because they’re feeling good about themselves after a win. Weis says it’s great as a coach when you can give constructive criticism after a victory, because players are more open-minded and listen to you better. • The entire night against South Dakota, the only real throw that quarterback Jake Heaps would have liked to have back was the deep throw to Rodriguez Coleman that he overthrew by a few yards. Weis liked that Coleman laid out for the ball. Weis says Coleman’s on the cusp of taking a meteoric rise up the depth chart. When he gets it, it’ll be tough for others to get him off the field. He’s playing from behind a little bit, because he got in late and was banged up a bit in fall camp. He’s healthy now. He has plenty of time to catch up. • Weis has no update on cornerback Kevin Short’s status (he missed Saturday’s game because of personal reasons). Short has some personal things he’s working through that were a bit of a surprise to KU’s coaching staff. When Weis knows something, he says he’ll be sure to tell everyone. • Running back Taylor Cox is going in practice today after suffering a leg injury at the end of the South Dakota game. Weis will have to see visual evidence to see what he looks like out there. No one else on the roster would be in the “questionable” range if an injury report was released. • Weis says it is too early to determine for sure if some guys are red-shirting. You have to see how things go at each position. Especially with freshmen, Weis tries to not make a decision with them until it gets closer to halfway through the season. If Weis is going to use a true freshman, he’s going to use him. He doesn’t want to burn a red-shirt year to get a guy a couple scrub snaps at the end of a game. • Weis says KU’s passing game against South Dakota was nothing like any game last year. No games last year looked anything like that. KU had four or five dropped balls and three throwaways out of 20, and KU completed 10. 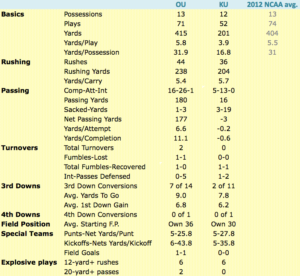 KU had two or three balls that were clear incompletions out of 20 throws. If KU gets that percentage this week, Weis will take it. Throwaways are part of what you do. They’re a good thing. Weis writes them down as a smart play. • For the program, winning last week got the losing streak out of the way. Winning this week could get the road losing streak out of the way. Winning against Texas Tech could get the conference losing streak out of the way. Saturday is a chance for another KU to get another stepping stone. • Weis says receiver Justin McCay was excited for his first game. It’s been a while since he played. The same could be said for Heaps. Weis expects both to be better this week. • KU’s pass defense didn’t really get threatened against South Dakota. KU did give up the one long gain on third and 19. There will be more time for evaluation of the unit in future weeks. • Weis liked having all his defensive coaches on the field. They were able to work through some kinks against South Dakota, too. People want to make a big deal about how KU is coordinating the defense. The only position that ties all the units together is the linebacking corps, and that’s why Bowen puts the defense together. • KU has a whole package for the Wildcat (or Jayhawk) formation. You have to put it in there so other teams have to work on it. There were a lot of things that KU did in that game on purpose. As the season plays out, it won’t be the last time you see Christian Matthews out there in that formation. • Defensive lineman Ty McKinney is playing really well, and defensive lineman Marquel Combs isn’t getting many reps. So KU bounced McKinney out to end so Combs could potentially get more time at nose tackle behind Keon Stowers, who is playing at a high level. McKinney also will have a chance to get first-team minutes at end, because he’s not beating out Stowers. So KU could get two positive residuals out of that. • KU has been practicing getting the ball snapped in 15 seconds or less. Weis doesn’t stand there with a stopwatch, but that’s probably close to what it was. Weis figured if he was going to have his defense practice against a high-tempo pace, he might as well do it on offense as well. • Victor Simmons has finally found a home at nickel back. He’s bounced between safety and linebacker at KU. Now, he’s settled into a position that he seems to be comfortable at. If you’re a good athlete and know what you’re doing out there, usually you start to make plays. That’s what’s happening with him. Breakdown: Why did KU’s run plays work against Oklahoma in the first half, but not the second?